Tina Syracuse with son Brian, who inspired her gluten-free creations. Staring at a supermarket shelf, inundated with claims like “natural” and “low fat,” it can be difficult to determine what’s actually healthy. Three local entrepreneurs took matters into their own hands, launching good-for-you food products that have found passionate fans. Look for them at stores across the area this winter. Growing up in New Zealand, Rebecca Brady was always experimenting with wholesome ingredients and recipes. 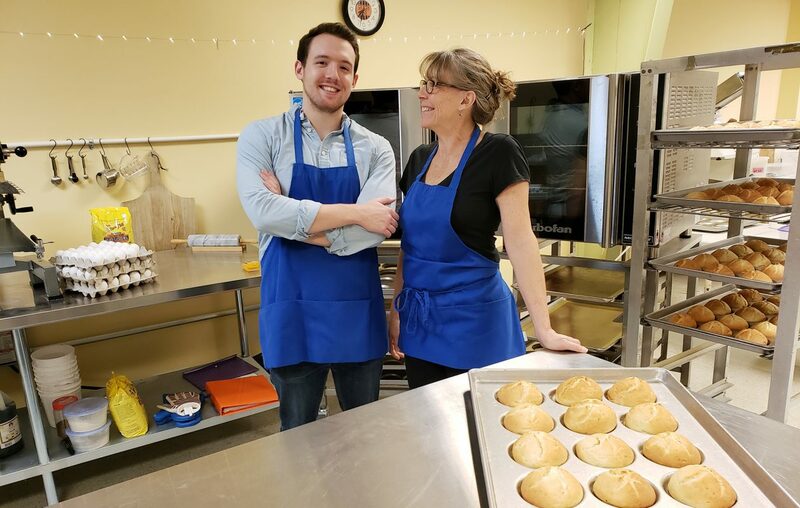 “Having traveled extensively and lived among diverse cultures, and having seen what people consider nutritious, for better or worse, my appreciation of food and its nutritional benefits has only grown,” said Brady, who moved to Buffalo in 2015. Among her culinary creations are gluten-free crackers made from seeds, ingredients known for their nutritional benefits, including protein, fiber, antioxidants, essential fats and various vitamins. As she shared these snacks with friends, she received rave reviews and decided to take the leap, launching TopSeedz in 2017. Her company sells three cracker flavors—cumin, rosemary and sea salt—and all contain sunflower, sesame, flax and pumpkin seeds. With the $50,000 Ignite Buffalo grant she won last year, Brady increased production with a new facility and plans to stock TopSeedz products in more stores, including Rochester-area Wegmans. Find them locally at Lexington Co-op and East Aurora Co-op. Syracuse spent years tweaking ingredients, ratios and processes, and finally created gluten-free bread that “tasted and behaved like ‘real’ bread and was healthy and nutritionally sound,” with no additives, preservatives, canola oil or corn starch. With her first gluten-free product, she launched Brian’s Best Gluten-Free Breads & Buns in 2007 and has since grown it from a single wholesale account to more than two dozen, including restaurants like Betty’s, Anderson’s and Pizza Plant (which her family owns). At the factory store in Cheektowaga, customers can try exclusives like sourdough, pizza and jalapeno cheddar breads. Trained in molecular biology and biochemistry, Ree Dolnick spent her entire career working in cancer research labs. At lunchtime, she’d reach for popular nutrition bars, but found herself continually disappointed by poor ingredients. So she decided to make her own. She dove into entrepreneurship in 2016 with Jeca Energy Bars, which today comes in three forms: almonds and dates, coconut and curry, and matcha and seeds. Dolnick says she chose specific ingredients for their healthy properties, like turmeric (anti-inflammatory) and matcha green tea (anti-oxidant).